Tharuni in collaboration with Telangana State Women's Commission organized one day Consultation on Compulsory Registration of Marriages with Government Departments and NGOs. Lok ayukta Justice Subhashin Reddy was the Chief Guest. Dr. Thripurana Venkat Rathnam, Chair Person, Telangana State Commission presided the Meeting. 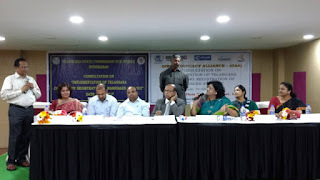 Secretaries to Government Dr. Mamatha Raghuveer, Founder , Tharuni, addressed the Participants, There were more than 45 recommendations made by them to implement the Act effectively.